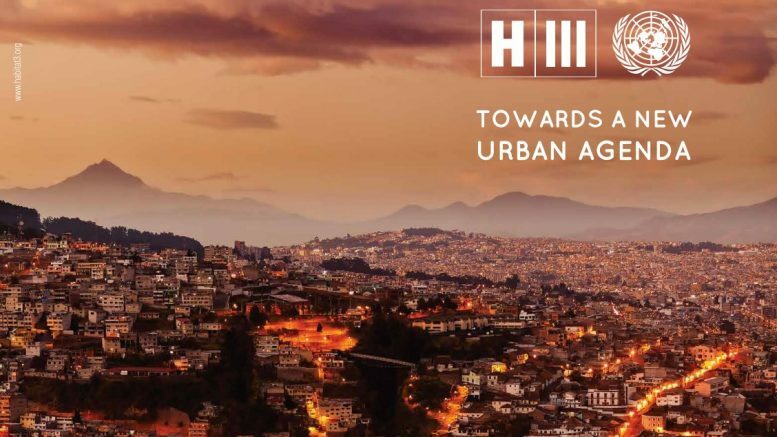 The New Urban Agenda is the defining document of the Habitat III conference in Quito, Ecuador, where urbanists from around the world gathered to discuss solutions for future urban development. 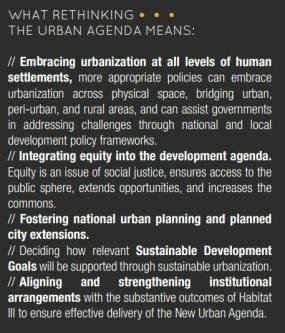 It has been intensely negotiated over the last months and has gone through many changes, but the final version, found here, was ratified at the Habitat III conference. 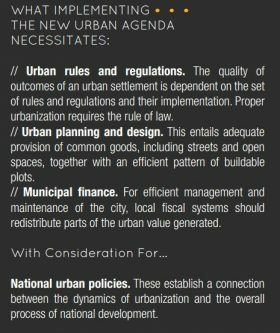 The document is 24 pages long, which is a significant change from the last Habitat conference which took place in 1996 in Istanbul – the resulting document was over 100 pages long in that case, which made it much more difficult to follow and implement – the New Urban Agenda is thought to provide more straightforward indicators about what cities should aim for in the years to come. Many experts, cited by Citiscope, insist that the New Urban Agenda is not particularly innovative, but rather transformational – as Holger Dalkmann and Alyssa Fischer at the World Resources Institute put it, innovation is expected in its implementation, and it is not seen as being focused on disruptive change. The fact that it is comprehensive and inclusive is seen as both a strength and a weakness by Judith Hermanson of IHC Global – she fears that the effort to ‘get everything in’ could lead to issues in prioritization. The importance given to subnational government and local leadership in the New Urban Agenda is also applauded by many, as urbanists have long argued for the principle of subsidiarity and decentralization to be applied to city development. the integrated vision of the territory, understanding regions interactions and responsibilities beyond administrative boundaries. Experts were also asked by Citiscope to identify the weaknesses of the New Urban Agenda. Some think that it operates without much awareness of present issues, such as the refugee crisis or other pressing problems, and that it does not do enough to prepare cities for future shocks through building resilience and social cohesion.